Since this is the first week of the new year, and everyone is talking about new beginnings, I thought, “What better time is there to talk about Florida’s First Coast?” Not only is it Florida’s first coast, but the first coast (by over 50 yrs. from Plymouth Rock) of the entire nation as well. (See a bit of the history below). Florida has a myriad of wonderful destinations for your family beach vacation, and what better way to start your family fun then to discover a little of our history while enjoying your family holiday? Read on to explore more kid friendly fun facets about this fascinating and beautiful area, and see why the First Coast is perfect for your Florida family beach vacation. 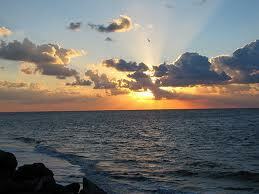 The principal cities of Florida’s First Coast include; Fernandina Beach, Jacksonville, Orange Park, and St. Augustine. The name “First Coast” was coined in the 1970s, when a group of representatives from local Chambers of Commerce wanted to market the region of Northeast Florida in a manner similar to other Florida regions, which had chosen such names as “Sun Coast”, “Emerald Coast“, and “Treasure Coast“. (click on links to find out more about each “coast”). The region includes all of the counties of Baker, Clay, Duval, Flagler, Nassau, and St. Johns. The history of the First Coast can be traced back over 12,000 years, when the area was first inhabited by indigenous Native Americans. At the time of initial European contact in the mid-16th century, the Timucuan people were settled here. Modern European colonization began in 1564, when René Goulaine de Laudonnière founded the French Colony of Fort Caroline, near the mouth of the St. Johns River, close to modern-day Jacksonville. On August 28, 1565, Pedro Menéndez de Avilés founded the city of St. Augustine for Spain. After defeating the French in skirmishes around the area, Spanish forces firmly established the area as their own. 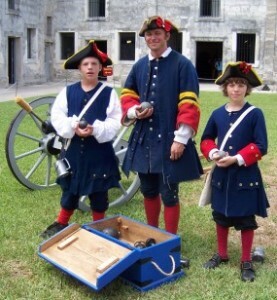 Spanish rule continued until 1763, when Spain ceded control of Florida to Great Britain. As the territory was taken over by the British, most of the Spanish population left the area, many of them going to Louisiana and other French territories. Many of the remaining native population also migrated before encroachment by Anglo-American colonists. After the end of the American Revolutionary War in 1783, Britain ceded Florida back to Spain, beginning the second period of Spanish rule. During this time, many pioneer settlers emigrated to the First Coast from the United States. The town of Cowford, now Jacksonville, was settled in 1791. In 1819, Spain signed the Adams-Onís Treaty with the United States, giving all of Spanish Florida to the U.S. for $5,000,000. Florida’s First Coast is such an interesting and varied area that your family will love all the diverse things to do here. History seamlessly blends with the modern and everyone will find something intriguing while discovering our past and having fun. You’ll find many significant historical landmarks including one of my favorites, Castillo de San Marcos, in St. Augustine, Florida where the Spaniard’s took a stand over 400 years ago. Another one of my favorites is visiting the old colonial school house while walking along the old brick streets of St. Augustine. America Begins Here… a monument not only of stone and mortar but of human determination and endurance, the Castillo de San Marcos was originally constructed to defend Florida against pirates hunting the Spanish treasure fleets traveling along the Gulf Stream, and symbolizes the clash between cultures which ultimately resulted in our uniquely unified nation. The Junior Ranger Program encourages children ages 6 through 12 to participate in their visit to the Monument and is a fun way for young visitors and their families to get the most out of their visit. Booklets are available from the information kiosk at the Fort Entrance. Read exhibits and view the movie in the Theater or take the self-guided tour. Attend a ranger talk or demonstration and ask questions. Then complete the activity sheets in the booklet. Completing all the activities in the booklet will earn children a certificate of completion and an official Junior Ranger Badge from the site. The Fountain of Youth Archaeological Park is a 15 acre, waterfront, Historical Site loaded with fun things to do and see. You can even drink from the legendary waters and see if your visit grants you the secret to eternal youth. Get a great view of the city and a little history at the same time. 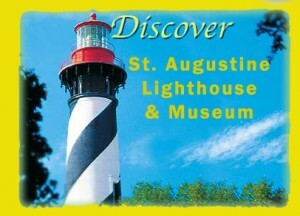 The St. Augustine Lighthouse & Museum is fun for the whole family. It’s recommended that you allow at least 1 hour to tour the site and climb the tower. The last ticket to climb the tower is sold at 5:45 pm. The site closes at 6:00 pm. During July and many holidays – open until 7:00 pm, with the last ticket being sold at 6:45 pm. Closed Thanksgiving Day, December 24th and December 25th. During bad weather, the observation deck and /or tower may be closed for your safety. If the weather looks threatening, please call us at 904-829-0745 to check the tower’s status. Be sure to shop in the museum store for quality lighthouse replicas as well as maritime gifts. Admission is not required to shop. The original Ripley’s! You can’t go to Florida’s First Coast and not see Ripley’s Believe it or Not Museum. This place is packed with the weird, odd and just plain strange, but more fun than a barrel of monkeys. Make sure to get a ride on the big red train, or take the ghost train adventure, the kids will be talking about this one for the rest of your First Coast vacation – visit their website to see what’s in store! And just a note, don’t bother going to Potter’s Wax Museum, it isn’t worth the price of the tickets, you’re better off going to the Irish Pub across the street and getting the ice cream..it’s divine! Location: South A1A about 25 minutes from downtown St. Augustine. Anastasia State Recreation Park is a protected bird sanctuary and consists of 1,700-acres and five miles of beautiful, sandy beaches. It features swimming, lifeguards, a bath house, hiking, nature trails, a boat ramp, fishing, a volleyball court, beach equipment rentals such as umbrellas and beach chairs, canoes, nature trails, grills and picnic areas, concessions, a covered pavilion, gift shops, playgrounds, and camping. Vehicles are prohibited from driving on the beach at this time. Hours and Admission fees: Hours are generally 8:00am until sundown. Admission $8.00 per vehicle. Limit 2-8 people per vehicle. $4.00 Single Occupant Vehicle. $2.00 Pedestrians, bicyclists, extra passengers, passengers in vehicle with holder of Annual Individual Entrance Pass. This serene beach is a local “best-kept secret” offering a wide variety of vacation rentals, lodging, waterfront restaurants, the Vilano Beach Fishing Pier, parasailing and Sea Doo rentals, and many parks. Be sure to visit Surfside Park, 3070 Coastal Hwy, and enjoy a picnic shelter, beach access and outside showers. You may even choose to charter a deep sea fishing boat or a sailboat. Vehicles are permitted on the beach within designated areas. Location: North A1A just over the Usina Bridge, only 3 minutes from downtown St. Augustine. Location: North A1A just past Vilano Beach and only about 5 minutes from downtown St. Augustine. Guana River State Park is a 2,000 acre sanctuary for endangered species. Recreational activities are many and varied. It features two public beach access facilities, consisting of parking lots and associated dune crossover boardwalks, along a 4.2 mile stretch of otherwise undeveloped beach on the Atlantic Ocean. Swimming, sunbathing, surfing, fishing, shelling and other traditional beach activities are enjoyed here. Pets are prohibited on the beach, but are allowed in other areas of the park on a six-foot, handheld leash. There are no overnight camping facilities or developed picnic areas. For a calendar of events or more information, visit their web site. Location: 2690 S. Ponte Vedra Blvd. Ponte Vedra Beach, just north of St. Augustine on A1A North. One of my very favorite places on Florida’s first coast is Fernandina beach, and Amelia Island. They are so beautiful and a one-of-a-kind experience that would be a blast for the whole family. We usually stay at Elizabeth Pointe (listed below in places to stay) which is by far the most wonderful bed and breakfast inn I’ve ever had the pleasure of visiting. The beds and linens alone are worth the stay. Plus, free cookies, bath amenities and a great happy hour that includes free snacks and drinks. The huge wrap around porch has lots of rocking chairs and gorgeous views of the beach below. Within just a few steps you are right on the beach. It’s a perfect spot for families, kids or couples. Beach, playground, skatepark, beach volleyball, mini golf, concessions, “Fins” oceanfront restaurant. Restrooms available. Beach, boardwalk, gazebos, picnic tables, paved parking lot (no restrooms). Sliders restaurant is located nearby. Beach, picnic tables. Restrooms and showers available. A 30-minute or 1-hour carriage ride, with descriptions of the history and landmarks of Amelia Island. Tours begin at 6:30pm. 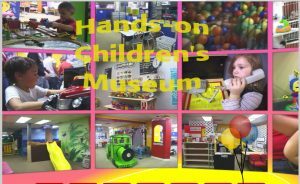 30-minute tour is $15 for each adult, $7.50 for each child under 13 years of age, and infants under 2 ride for free. 1-hour tour is $30 for each adult, $15 for each child under 13 years of age, and infants under 2 ride for free (plus tax). Call for reservations. Private tours and ghost/pirate tours also available. Provides custom local history tours of Jacksonville, Amelia Island, and St. Augustine, as well as sightseeing tours & transportation to other parts of Florida. Tours for kids and adults in groups of 4 to 47. Tour guides will transport your group or can “step on” your transportation vehicle. Central Park Is located just east of downtown on Atlantic Avenue. It features basketball courts, tennis courts, baseball courts, picnic areas, and playgrounds for kids. Egan’s Creek park is located about 1/2 mile from the ocean and has a baseball field, playgrounds for kids, and picnic area overlooking the scenic Egan’s Creek marshlands. There is always a Park Ranger on duty at the fort and often times, some volunteers as well. There is no set time for Ranger Programs but there is constant roving interpretation taking place. The Fort staff are usually offering a first-person interpretation of the Fort life as it was in 1864 by portraying soldiers and workers stationed at Fort Clinch. Fees: Park entrance fee ($5.00 per vehicle up to 8 passengers). Little Vets-Children can dress up like a Veterinarian and give the pets a checkup. Use the stethescopes, microscopes or check on the new born animals in the incubator. Turn on the X-Ray Viewer and check out the Turtle with eggs. Kids Mini Bank-Act like a Bank Teller and give loans or open an account, write checks or make deposits in your new account. Learn how money is made. Winn Dixie Lil’ Grocery-NEWLY REMODLED! Pick up a grocery cart and shop for tonights dinner. Then act like the cashier and ring up your groceries on the real cash registers and real conveyor belts. Kids U. S. Postal Office-Write letters and mail them in the mail box. Act like the Mail Carrier and sort and deliver the mail. KIDS TV / Radio Newsroom-Sit behind the News desk and give the Weather, Sports or Local News. See yourself on the TV monitor or give the news over the Radio Mic. You’re the Star Stage-Newly Remodled! Dress up in one of over 50 costumes and put on a show for the audience on the Stage. Wheelchair Basketball-Play basketball in a wheelchair. Challenge someone to a game and see who will win. S.S. Spinghetti-Climb aboard the boat and sail around the world. Check out all the sea animals in the boat. Then slide down the big yellow slide to exit. Puppet Stage-Newly Remodled! Put on a puppet show in the Blue Puppet Stage with one or more of over 50 puppets or in our Castle Puppet Stage and then build your own castle. First Adventures Toddler Room-Newly Remodled! A play room just for children up to age 3 with a built in play house, a 5′ doll house, a GIANT CATERPILLAR you can crawl through, a castle and more! 50’s Cafe’-Take orders for lunch in the bright red 50’s Cafe’. Sit on the big red stools and enjoy lunch at the 50’s prices. McDonalds’ Climbing Tubes and Ball Pit-Have fun climbing the Pink, Green and Red Tubes or jumping in the Ball Pit. KIDS Jacksonville Fire Department-Newly Remodled! Walk up the Ramp and Climb down the Fireman’s Pole. Put on a fire hat, boots and a jacket and then drive the fire engine to put out the fire in the house. Learn about Fire Safety. 8′ Train and 2 Train Tables-Buy a ticket from the Train Ticket Booth and take a ride on the train or play with Thomas and Friends on one of our 2 train tables. Jacksonville Police Kid’s Substation-Ride in the Police car, Call out License Numbers over the Police Radio, Learn about 911, See how Observant you are and more! Amelia Island: This naturalist’s delight is bursting with fish and fowl. The island attracts birds of all kinds – especially snowbirds who love the peaceful beaches and natural wildlife. Nature enthusiasts come to see dolphins, manatees and whales breaking water offshore. Fernandina Beach: Relatively untouched by developers, this is a family-friendly location. It’s also perfect for couples tying the knot with a destination wedding or those who have been hitched for years – horseback rides along the beach, golden sunsets and beautiful historic buildings make this a romantic getaway for lovebirds of any age. Ponte Vedra Beach: With the best golf in the South, it’s hard to think beyond the course. But ghost tours, historic lighthouses, wine festivals and some of the best bird watching also draw visitors from around the world. Kids will enjoy the show as Japanese chef’s prepare their meals right in front of them. For more kid-friendly restaurants you can visit while in the Beaches area, visit Jax4Kids.com’s Kids Eat Free pages and scroll down to “discount for kids and kid-friendly restaurants”. I’ve personally stayed at Elizabeth Pointe every time we go to Fernandina Beach and it is by far the nicest bed and breakfast inn I’ve experienced. The beds are the most comfortable I’ve slept on EVER, and the people are so nice there. I couldn’t recommended highly enough…plus it’s right on the beach, what more could you ask for! Thanks for visiting BestKidFriendlyTravel and reading my post 😉 If you’ve stayed on Florida’s First Coast before or had a fun family adventure in St. Augustine, Fernandina Beach / Amelia Island, or the Jacksonville area, leave me a comment about it, I’d love to hear what your favorite part of the First Coast was!